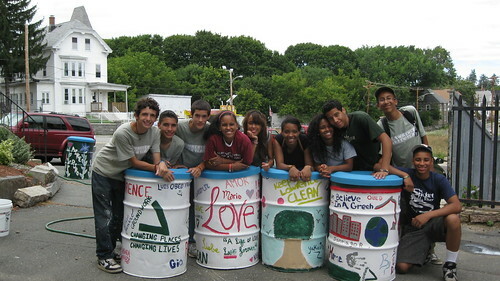 Through its education, community service and job training programs for Lawrence youth, Groundwork Lawrence cultivates respect for the environment, social awareness and healthy behavior, preparing young people to be positive role models and future leaders in their community. The Groundwork Lawrence Green Team is a year-round program that offers part-time, paid employment for 10 Lawrence high school students each year. Members learn about and lead local environmental and healthy community initiatives, conduct research, raise awareness, challenge their peers to do community service and participate in hands-on improvement projects throughout the city. The program is intended to promote the protection and restoration of Lawrence’s critical ecological systems, natural resources and public health by engaging teens in advocacy and service-learning focused on the community’s parks, streets, gardens, waterways and vacant open spaces. The Green Team program has dual goals: to prepare Lawrence’s youth for a lifetime of environmental and healthy community leadership, and to invest in Lawrence’s future capacity to improve its physical environment. 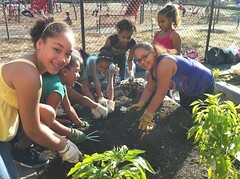 Groundwork Lawrence aims to cultivate healthy habits at a young age with environmental education programming that promotes healthy eating, fitness, and environmental awareness. Groundwork Lawrence education coordinators work with over 1,000 K-8 students at Lawrence public schools in after school and extended learning time programs during the school year and additional students in summer programming at the YMCA and the Leahy and Bruce schools. Our lessons integrate opportunities for students to explore local parks and ecosystems and earn about the natural world through the lens of urban ecology.